It’s the oldest local tradition in England and it all started in the 14th century. 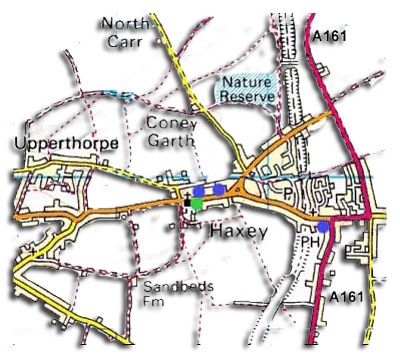 In early january of every year the parish of Haxey, near epworth in the Isle of Axholme plays a slightly mad game called the ‘Haxey Hood’. An old and unusual game known as the Hood Game, or Throwing the Hood, is played every year on Old Christmas Day, January 6th, at Haxey in north Lincolnshire. Haxey Hood has a character all of its own. It is the great festival occasion of the parish year, when everyone keeps holiday and some very interesting customs are observed. 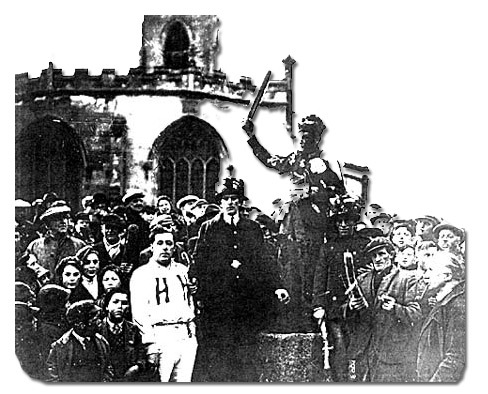 The ceremonies of the Haxey Hood begin in the early afternoon with the procession of the Fool and his twelve ‘Boggans’ up the village street to a small green outside the parish church. The Boggans are the official team of players in the Hood Game, and play against all comers; they are, and need to be, vigorous young men who are often useful members of the local rugby or football teams. Chief among them is the King Boggan, or Lord of the Hood, who carries a wand, or roll of thirteen willows bound with thirteen withy-bands as a badge of office. Tradition demands that he and all his team should wear scarlet flannel coats, and hats wreathed with red flowers. A few Boggans may turn out in their ordinary clothes, but invariably the ritual red appears somewhere in their dress, if only in the form of an armband or some fluttering scarlet ribbons. The Kings of Low St, Haxey. Duke William Hotel of Church St Haxey. The Loco of 31 Church St, Haxey. Carpenter’s Arms of Newbigg, Westwoodside. The Fool, leads the procession and has the right to kiss any lady he chooses throughout the day, and will have a good deal of red about him. His face is smeared with soot and red ochre, and his sackcloth trousers are patched with pieces of red cloth cut in a variety of shapes. In his hand he carries a whip with a sock filled with bran at the end of the thong, and this he uses for the time-honoured purpose of whacking those who are unwary enough to come within reach. The Fool and the Boggans will have already been busy in the week before the event visiting nearby villages inviting all and sundry to come to the Hood-throwing, and at the same time collecting money for the festival expenses or local charities. On the day itself, when the procession eventually reaches the village churchyard, the Fool mounts a stone that once formed the base of a tall cross. There he makes a speech, welcoming all present and inviting them to join in the game, and mysteriously stating that two bullocks and a half have been killed, but the other half had to be left running about the field, and can be fetched if it is wanted. Which translates as … ‘Pub against pub – town against town – if you meet someone, knock him down but don’t hurt him’. While the fool is speaking, a small fire of damp straw is lit behind him, and a cloud of smoke pours out all round him. In 1956 an eye-witness recorded that ‘someone forgot to damp the straw, and the Fool caught fire. Luckily, many willing hands soon extinguished the blaze. This is known as ‘Smoking the Fool’, and is the modern version of an ancient ceremony, which formerly took place on the morning after the Hood Game. Following the speechmaking, the Lord of the Hood leads the whole crowd of contestants, supporters and perennial spectators, along with the curious and the simply mystified, to the traditional cornfield on Upperthorpe Hill. The Boggans stand in a wide circle and the Lord of the Hood and players from Haxey, Westwoodside, and the other parts of the wide parish stand inside the ring. The Lord throws up the first Hood, one of several minor hoods, which are played for first. These ‘hoods’ actually bear no resemblance to the headgear from which they are supposed to take their name. The lesser ones are tightly-rolled pieces of canvas, tied with ribbons, and the main, or Leather Hood, which is played for later in the game, is a two-foot length of thick rope encased in stout leather. As soon as the first Hood is thrown up, there is a fierce struggle for it, every man trying to seize it and carry it over the boundary to his own village. If any one manages to get it safely over the line and away, he can keep the Hood; but in order to do so he has to elude, not only the watchful Boggans, but all the other players who rush after him and try to tear it from him. The function of the Boggans is to prevent the Hood from crossing the boundary. If one of them captures it, or even touches it, that Hood is ‘dead’, and is returned to the Lord to be thrown up again. When all the minor hoods have been disposed of, the ‘Sway’ (the really serious part of the game), begins. The Leather, or Sway Hood is produced, and is thrown straight up into the air, either by the Lord or by some prominent person present who has been invited to do so as a mark of honour. The ring of Boggans breaks up, and all semblance of orderly play disappears. A solid compact mass of struggling humanity pours slowly down the hill, swaying backwards and forwards as the varying pressure of the pushing heaving crowd dictates. The Hood may not be kicked or tossed forward, but only ‘swayed’, that is, pushed, pulled, or dragged towards one of the three pubs that serve as the ‘goals’ of this strenuous contest. Every local man who is not too old to do so is expected to take part in this grimly earnest struggle. Stragglers are rounded up by the Boggans, and men on the edge of the watching crowds may be swept into the Sway as it moves slowly onwards. Everything in its path goes down before it, including hedges and sometimes even stone walls. Two hours or more may go by before one faction or another is finally victorious, and the Sway arrives at one of the hostelries and victory is signalled. The ecstatic crowd follows, intent on much ale-swigging, folk singing and having the granddaddy of all parties. The landlord provides free drinks for all, and the Hood remains in his keeping until next Haxey Hood, except when it is needed for some reason, and is fetched away by the Fool or the Boggans then in office. At one time, it used to be ceremonially roasted before the pub fire and doused with ale as it turned on the spit, the ale being then drunk by those present, fortunately this interesting custom is no longer carried out. 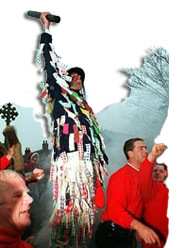 Like many other ancient rituals of which the origin has been forgotten, the Haxey Hood Game is locally explained by a legend. This says that in the thirteenth century, Lady Mowbray, then Lady of the Manor, lost her scarlet hood in a high wind when she was riding from Haxey to Westwoodside. The flying hood was pursued and caught by twelve labourers who happened to be working nearby, though not without considerable difficulty because of the strength of the wind. As a reward for their help, she bestowed upon the parish thirteen half-acres of land, the rent of which was to provide a feast and a hood to be played for every year on the same day forever. The piece of ground on which the Hood Game always begins is said to be the place where her hood blew off, and presumably it is also one of the half-acres that she gave. Exactly where the other twelve are is now unknown, for the deeds have all been lost. Hoodia is a powerful flavour suppressant cost diovan us so as to has..